The Girl from the Bar. The fog falls down on the city of Ljubljana like a blanket every night. 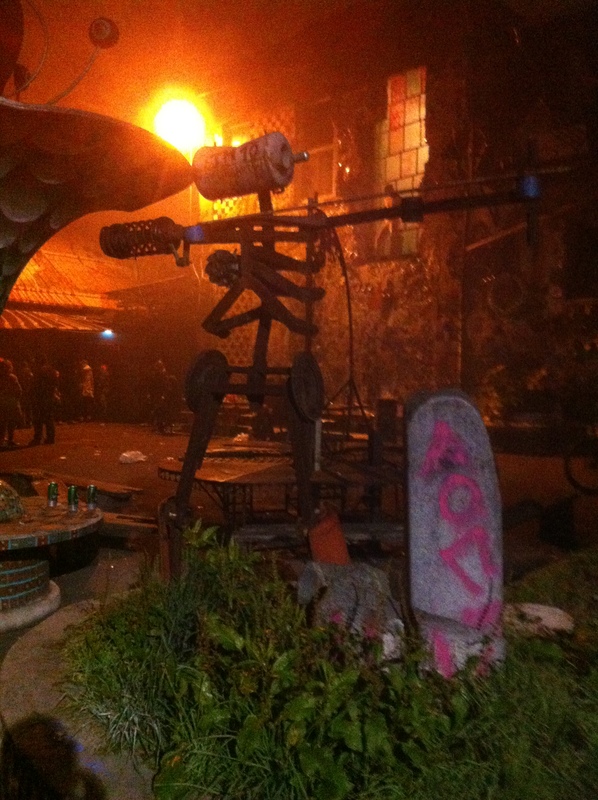 The streets look eerie and mysterious. The only sound is our hero staggering on the cobbles towards the centre, his mind floating in a comfortable haze. He is a traveller, mere visitor to the city, on his way to his lodgings. Or so he thought. If there was an observer he would see a guy with a strong build, not really athletic, like a boxer in 1920’s. A George Foreman in his BBQ years. A swish in the air above his head makes our hero to look up and the street lamp illuminates his face for few seconds. He catches a glimpse of a shadow, a huge shadow, which disappears again in the direction he was heading. One too many local ‘Lasko’ beers could play with your imagination on top of which he had shots of ‘Bear’s Blood’ in Metelkova Mesto. Here he met the girl, dark haired Slovenian goddess and it was her, who suggested the shots. Otherwise he would not mix his liquors, but he wanted to impress her, to show how tough he is. Later he lost her in the crowd. What was her name? An ear-splitting roar interrupted his train of thoughts, better yet it derailed the train and now it was on fire turned on its side with people screaming and pieces of luggage lying around. He could feel the vibrations caused by the sound, but now the city was quiet again, too quiet. The silence was deafening. A lone figure emerged from the mist and was running towards our hero. His blonde hair standing out as if electrocuted, an expression of sheer horror on his face. “Zmaj sa vratil” he shouts his eyes bulging. But the madman was gone, his footsteps receding in the distance. “Lehka noc” our hero muttered a good night wish after him in the local dialect. Something he picked up during the few hours he was here. Some of the lights in the windows came on and few heads peeked out into the night. 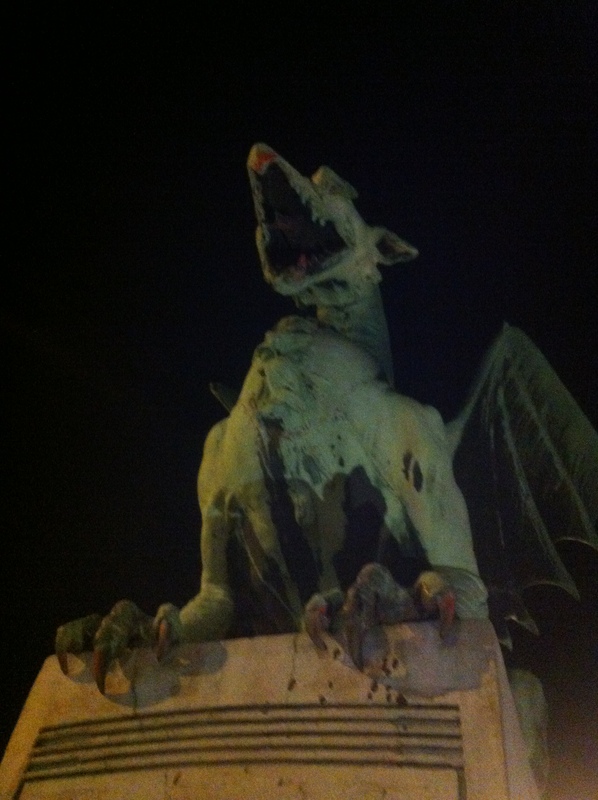 He looked at the statue of a dragon nearby, the ever present symbol of Ljubljana, with unease. Then he smiled and shook his head. He recalled the legend about the origin of the city, built in a nest of a slayed dragon. The girl in the bar mentioned the tale. What on earth was her name? He turns his head towards the castle on top of the hill, the only building in Ljubljana not built by Joze Plecek, but could only make out a faint shade in the fog. But something strange was going on; the castle was getting brighter very fast. At the same time it was getting warmer and this was not thanks to the ‘Bear’s blood’. Our hero watches in horror the incoming flames, but only for a second, before the flames engulf him and eat him whole, warts and all. He did not even have a time to scream as he was turning to ash. Before disappearing completely from this world, the last drop of ‘Bear’s Blood’ in his stomach flashes with a bright blue spark. Our hero’s last thought is the girl in the bar, her beautiful face. What in hell was her name? thank you 🙂 I really enjoyed yours…I looked at some others as well. Good luck with your books.